The Genealogue: He's Small, but He Has No Decency! He's Small, but He Has No Decency! 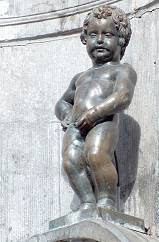 One of the most beloved landmarks in Brussels is the Manneken Pis—a 24-inch-tall bronze statue of a naked boy peeing. Whom the statue depicts depends on which story you believe. Another possible explanation identifies the boy as two-year-old Duke Godfrey II of Leuven, who was placed in a basket and hung from a tree during a battle in 1142, but managed to repel the enemy forces by tinkling on them. Check out his official website, or this panoramic view of the Manneken, but "Be careful! He's small … but he has no decency!" I personally think the Czech peeing statues are impressive... I mean how high tech can you get? Here's a link to that glorious invention. I can do the same thing, but only in the snow after drinking lots of coffee.